Configuring devices from the command line is time-honoured tradition for network engineers. But for everyday operational tasks, the CLI is no longer fit for purpose. Complex configuration – moving for 100 lines to 1000 lines of configuration. Moving from device-centric to path-centric and on the way to application centric. The command line will remain a critical troubleshooting tool for each device – hardware or software. It is not going away. Today, networks are mostly limited to the total number of hardware devices. Soon (if not already) networks will be using software or virtual devices to replace them. Instead of a single large firewall, expect to use many small firewalls to create microsegment in the WAN, Data Centre and Campus. IPv6 is a lesser problem of administration because of the complexity of recognising IPv6 addresses as something meaningful. i.e. Micro segmentation is an unstoppable security need. In my view, it is a ‘good enough’ solution for patching security on Enterprise networks by reducing the effective attack surface after a compromise. Smaller segments restricts access for privilege escalation. Command Line – as the number of devices in our networks grow, the use of the command line for operations becomes increasingly inefficient. Feature Fetish – Equally, configuration of a network by singly configuring each device is becoming more complex. Ten year ago, a router might have as much 100 lines of configuration and today its common to have hundreds or even thousands of lines as vendor fetishise more & more features into their products thinking that will sell more products (false premise). IPv6 – the days for looking at a ‘show ip route’ and easily decoding that 192.168.30.0/24 is the Glasgow office are over. You can easily insert your own particular problems here. Most people know in their gut that CLI configuration has become unworkable, they just might not have realised it. Users don’t care about packets, they cares about flows and applications. 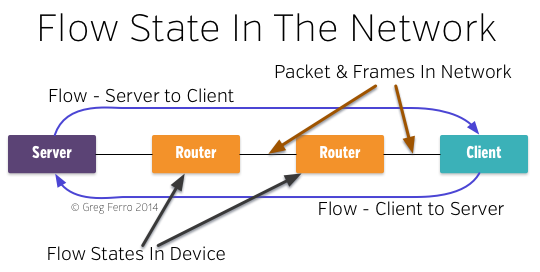 Devices handle packets as part of flows. Configuring a single device requires an end-to-end knowledge of the entire path – something that the CLI isn’t good at doing because its device-centric when its needs to be end-to-end. Having dozens of SSH consoles open isn’t the right way to validate a network path that crosses ten or twenty network hops. Or building a QoS policy for each node with 100+ lines of configuration that is unique to that device. Consider that an external management software can present an end-to-end image of the entire network through mapping. Or use application inspection to provide real data about the bandwidth consumption and app performance. The Command Line will remain the pre-eminent tool for troubleshooting the devices themselves. It’s not going away but it will become the domain of high level engineers with specific product skills instead of the default method of operation. In the same way that programmers build apps while users consume them, network operations will use networks via applications. Network programmers will use CLI for deployment and troubleshooting only. The challenge for vendors is to get better at building software for management and operations. But this another article, I think. Thanks Greg for the great article. I ask though because I’m never really sure of what would be the correct answer, what software out there should I look at for good device management. I have a network of around 50 devices (all mid-level Cisco routers/switches/firewalls) and finding something stable to maintain and manage ports and flows would be incredibly helpful for some of my team who cringe when I open up Terminal to check a vlan on a switch port. I think you get the point I’m trying to make. Daily operations is way too hard using the CLI. And hand cranked automation solutions based on Python scripts or frameworks are not the answer either. The cost of ownership of a network is way out of proportion. Sure, but SNMP or Netconf are not the solution either. It seems to me the future is to use the same tools as servers, i.e. Puppet, Chef, Ansible, SaltStack, etc. I’m doubtful about this. These are frameworks and APIs, not products and solutions. We are not going to see large numbers of network engineers learning how to program Ansible just to enable a port or add a VLAN. Some people, sure, but the majority will use some sort of “MS Word” that does 80% of network functions without understanding the technology. “You don’t have to be a mechanic to drive a car”. The short term future is automation scripting using frameworks like Ansible. The long term future is SDN application and platforms which will deliver much more than automation of the CLI. Both systems will use SNMP & Netconf to configure devices in addition to emerging APIs such as OVSDB. Hmmm, I’ve never thought that far ahead strangely, good point, thanks. As Ivan often points out, distributed systems are hard. I think the whole industry (including customers) is responsible for not even trying (or wanting) to deal with that fact. Perhaps this is historical and down to the end to end principle and other foundations, perhaps it’s financial – probably a mix. GUI or CLI tools for network devices have always been poor, despite the single device model. Why can’t the ‘show cdp neighbors’ command have a ‘pretty’ option that ‘draws’ a basic map of the connected devices (ASCII art anyone)? Same for routing protocol neighbours, ICMP tools etc.. This should be even nicer in a GUI. Hell, any alternative option to modify output would be nice. Why can’t LLDP be modified so devices also report CPU and memory consumption and this can be used as a ‘back off’ mechanism (if there is an alternative path). You get the idea – everything is dumb. Sure, we have some ‘complete’ solutions (I’m thinking Big Switch) but these are only complete because they are limited to a specific, well contained architecture. 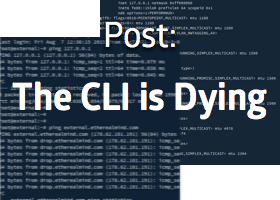 CLI vs GUI is a distraction (as you do point out); what we need are good operational tools (and possibly protocols) that are designed with distributed systems and management of those systems in mind. And now we see the journey to the future. The current APIs, protocols and methods are just the first step down a long path to the future. I doubt most of them will survive. I think a lot of choices were made due to hardware limitations on older switches, which we have kept doing because that is what we have always done. I’d like to see configuring hardware move away from forcing you to think like an ASIC when you do ACLs, QOS, etc.